We forgot about the bananas again. With little more to work with than two overripe bananas and a zucchini from John’s mom, who had bought zucchini in bulk and quickly grown extremely tired of zucchini, I wasn’t sure I’d be able to figure out anything delicious to make. But I noticed that people do seem to like banana and zucchini together in bread form, so I started to wonder if there was some other non-bread way to make that happen. 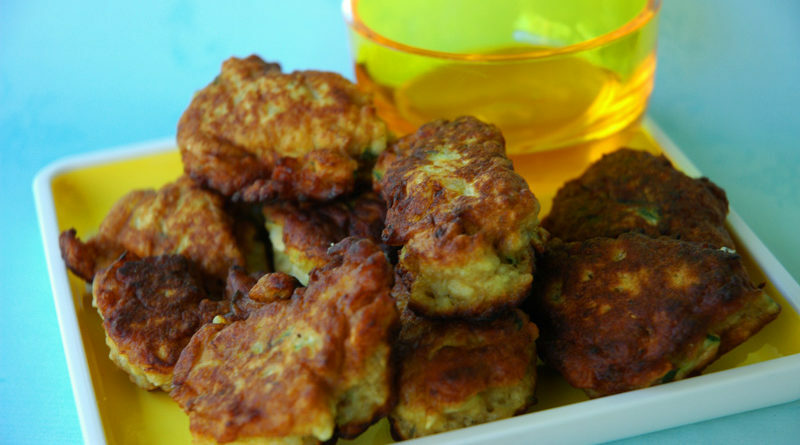 A recipe for Spicy Banana Zucchini Balls, which I found on Cafe Nilson, made all the sense in the world. Fritters! Yum! Curry… probably also yum, but not what I was in the mood for. I felt like something sweet, not a savory banana adventure. But after a few quick tweaks and 15 minutes in the kitchen, I had a sweet, crispy, delicious banana fritter dessert, with soft smooshy insides. It’s got oats and zucchini (good for you!) but it’s also fried in oil (um), so I’m not sure what kind of health-rating I can hope to net here. What do you think? Mix everything together (well, everything but the vegetable oil, geez) in a pretty big bowl. When it’s all in, you should aim for a consistency somewhere between batter and dough, so you might need to add more flour if the mixture is too runny like a batter. You definitely shouldn’t be able to roll a ball out of your dough, but when you drop it in the pan, you don’t want it to spread out like a pancake, either. Heat some oil (less than 1/2″ is plenty) in a big pan over medium-high heat. Drop a blob of batter (a heaping tablespoon or more, depending on the size of fritter you want) into the pan. You can do more than one at a time, of course, but be certain to keep a vigilant eye on all of them. Let them brown, then roll them around so you can get them crispy on all sides, but not too dark. 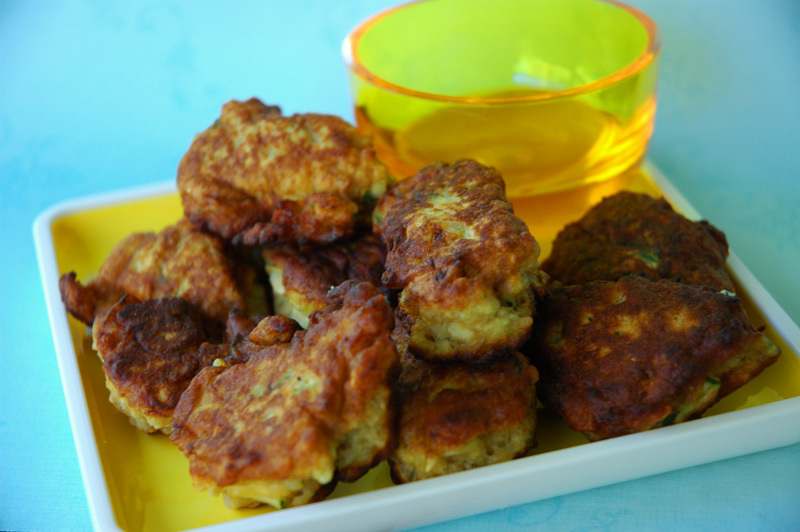 When a fritter is cooked, remove it from the pan and set it on a paper towel to drain. Serve hot with extra honey for dipping.